Guide: provides data for course corrections to create a winning product or service across the entire value proposition. Forewarn: forewarns you of problems before you hit them and illuminates potential alternatives. Inform: keeps others informed of the initiative's progress so they can coordinate their efforts. You cannot manage what you don't measure. Innovation metrics motivates managers and leaders across your organization to embrace innovation broadly and give it ongoing priority. The adage "that which gets measured gets done" is no less true of the innovation process than any other. Once innovation goals are broadly communicated and rewards for achieving milestones are established, the pace of ideas to implementation accelerates. Sustainable growth is the result. 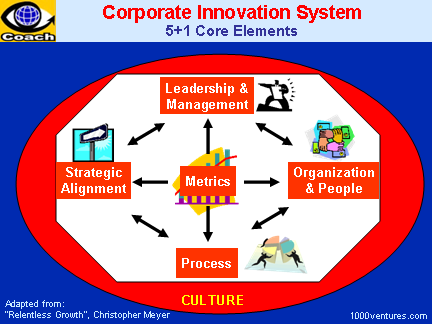 Innovation metrics should be applied to the three dimensions of your innovation system - strategic planning, process, and people. Descriptive: to demonstrate the overall effective contribution of new products. Don't ignore the other measures and focus on R2I alone though. R2I is driven by all the other metrics, since all have an impact on the bottom line. Remember also, that for R2I measurement to work, the process must be applied consistently to all new products and services.